I have been learning Photoshop Post Processing for several years very slowly but I really jumpped in with both feet over the past few weeks. I have learned a lot and wanted to test out some of those skills. I wanted to do a tight cropped image with B&W and color. 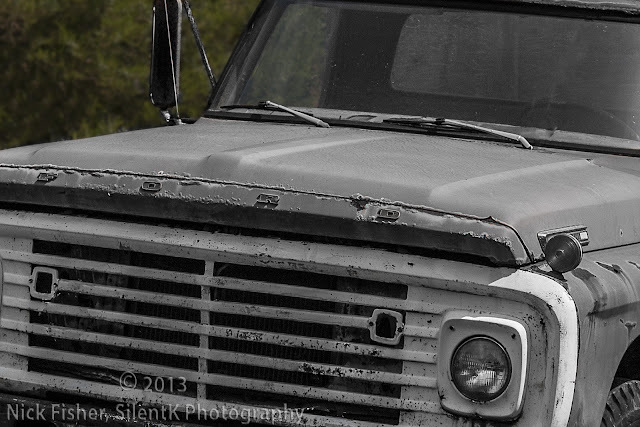 I decided that I would do the truck in B&W and keep the trees and the surroundings in color, the challenge here would be to draw attention to the B&W part of the picture since usually you would want to draw attention to the color. I cropped it in tight enough that there was not much green left, picked out all the weeds from the grill, masked out the truck and desaturated it. I thought it was looking good but needed some work. The glass gave me some problems. I wanted to have the green trees that you can see through the grass to stay green. After several hours playing with masking, layers and the selection tools I was able to remove the glare from the windshield and bleed the green through the glass. Next I sharpened the FORD logo and adjusted the levels to make the black and white "pop" some more. 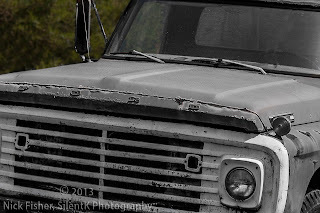 Finally i removed the large bush on the left and gave the whole background a gaussian blur to draw attention away from it and towards the truck.